So if you haven't figured it out, I turned the soup bowl from On the Mend into a cauldron by drawing the little feet and the "to: Santa" card from Cozy Christmas into a book. The bubbles are from Critters in the Sea and I'm sure can all figure out where the cat and hat came from. I am playing along with Lawnscaping with this one, this weeks challenge is dimension. I used foam adhesive to pop up the frame, cauldron, book and some bubbles. By the way, Micro Pop-dots are a must have for adding dimension to small things like the these bubbles. Thanks for stopping by today! 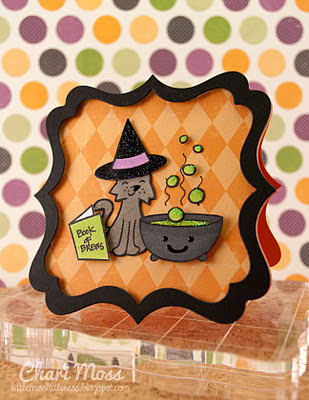 Lawn Fawn October Inspiration Week starts Sunday and I can't wait to share my projects with you! Oh just stop. Stop with your brilliance! This is awesome. OH MY GOODNESS, this is BRILLIANT!!! Geez, you design amazing buildings and now this! I am totally going to CASE this. You rock! WOwwwww Chari, the first time I saw this on flickr, I just LOVEEEE it....Sooo creative idea, love the scene....Amazing!!! So flipping brilliant, Chari! You are AWESOME!!! Awesome & super cute card!!! Great card, love when you think outside the box! Cool colors too. Aww super cute and clever!! I love the cauldron with green stickles, you're awesome! Ack! This is so stinkin' cute!! OFMG (oh my freakin' gosh)! This is ADORABLE!!! You know I found a little Halloween caldron in the dollar section of Michaels & thought up a similar scene but havent played yet. Never - ever - would I have thought this up - amazingly fun!!! So clever and the bubbles - too cute!!! OMG! This card is sheer BRILLIANCE!! Love every little detail....you are a shoe in for "top mow it all"!! Chari, you always rock my world with your cards. The colors here are absolutely stunning, and you've used all of these sets so creatively together. Basically, you're awesome. 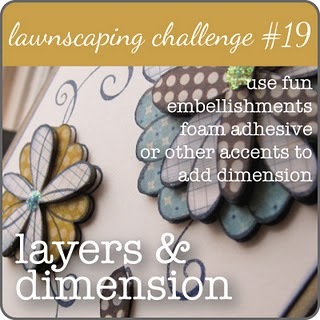 :) Thanks so much for playing along with us at the Lawnscaping Challenge! this is such a fun card, I love it! Congrats on being a mow-it-all too!